In a companion volume to his award-winning adaptation of The Odyssey, the incomparable graphic novelist Gareth Hinds masterfully adapts Homer’s classic wartime epic. More than three thousand years ago, two armies faced each other in an epic battle that rewrote history and came to be known as the Trojan War. The Iliad, Homer's legendary account of this nine-year ordeal, is considered the greatest war story of all time and one of the most important works of Western literature. In this stunning graphic novel adaptation — a thoroughly researched and artfully rendered masterwork — renowned illustrator Gareth Hinds captures all the grim glory of Homer's epic. Dynamic illustrations take readers directly to the plains of Troy, into the battle itself, and lay bare the complex emotions of the men, women, and gods whose struggles fueled the war and determined its outcome. This companion volume to Hinds’s award-winning adaptation of The Odyssey features notes, maps, a cast of characters, and other tools to help readers understand all the action and drama of Homer's epic. Gareth Hinds is the acclaimed creator of the graphic novels The Odyssey, Poe, Beowulf, Macbeth, Romeo and Juliet, The Merchant of Venice, and King Lear. He lives near Washington, D.C. In his latest graphic novel adaptation of a classic text, Hinds (The Odyssey) condenses Homer’s epic poem of gods and mortals at war, covering most of the major events and adding supplemental material that expands the story slightly beyond the original...The most striking scenes are the battles, presented in intimate detail and in awe-inspiring, sweeping overviews. Hinds’s relatively plain language retains just enough meter to hint at the cadences of the work, and, together with the dynamic art, creates an accessible entrée to an enduring classic. Clear scaffolding, well-chosen abridgements, readable prose, and stunning art invite readers into this exceptionally compelling version of the episode of the Trojan War handed down through Homer’s Iliad...Readers who have struggled to follow the poetry of the standard text or to become emotionally invested in a summary will have no such difficulty here; Hinds has truly produced an easy-to-follow, engrossingly cinematic blockbuster on the page. "Sing to me, O Muse, of the rage of Achilles": a rousing graphic rendition of Homer's great epic...An expertly crafted rendition and a welcome invitation to younger readers to immerse themselves in the ancient past. This modern graphic novel retelling of Homer’s epic immediately draws in readers with its artistry and readability...This is a well-done adaptation of an important, thought-provoking poem. Arrestingly, Mr. Hinds depicts the meddling immortals in translucent, sugary Easter-egg colors. This initially whimsical-seeming decision has the effect of highlighting the mocking distance between the fickle, impulsive Olympians and the flesh-and-blood men and women who pay the price for divine caprice on the earth below...Those who know the epic will find an engrossing and rewarding account: gory, affecting, unforgettable. This is no mere comics adaptation of an ancient classic. Through his intricately illustrated panels, Gareth Hinds brings us The Iliad’s depth, brutality, and power. A Herculean effort worthy of the original. 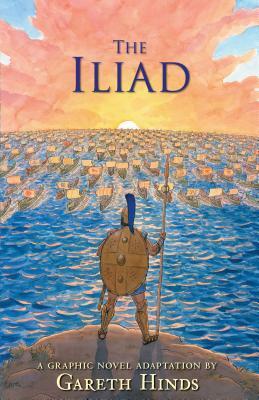 With his graphic novel retelling of The Iliad, Gareth Hinds has created a work of such scope and power that it boggles my mind. It truly lives up to the — dare I say it — epic scale of the original poem.